Putting a modern twist on the traditional cream tea, The Dorchester's Ice Cream Tea is a tasting of mouth-wateringly delicious, home-made ice creams in four natural flavours served on a perspex arch in miniature cones and - should you choose - La Passion de Fressa cocktail or an ice cold glass of bubbles. A selection of carefully chosen ice cream flavours are available including earl gray ice-cream in lemon cone, elderflower sorbet in strawberry cone, cinnamon and cox apple sorbet in chocolate cone and honey ice cream in a chocolate cone. 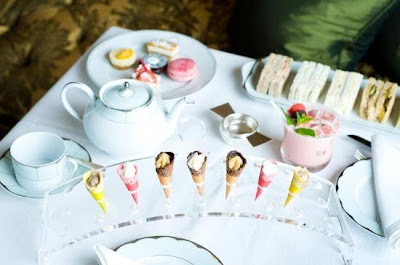 Ice Cream Tea also includes a selection of finger sandwiches, warm scones from the in-house bakery with homemade jam and Cornish clotted cream, a selection of French pastries and our especially selected grand and rare teas. Ice Cream Tea is served five times daily at The Dorchester, 1.15pm, 2.30pm, 3.15pm, 4.45pm and 5.15pm in The Promenade and in The Spatisserie. Such a cute idea, but the ice cream thing is a no-go for us non-dairy kids! 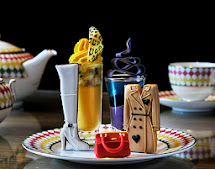 Such a novel idea for summertime afternoon tea and I love the photos! Have you tried it yet?